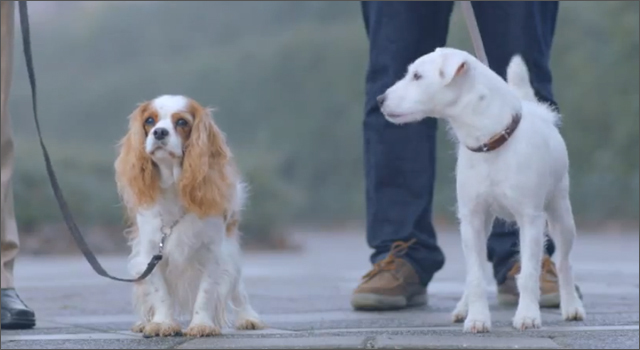 A new ad from Volkswagen Netherlands features a cute Jack Russell Terrier (possibly a Jackapoo), that is so impressed by the neighbour’s VW that he spends his day pretending to be one, much to the chagrin of his beleaguered owner. The dog makes engine revving sounds at the crosswalk, makes tire suealing sounds in the park, beeps as it’s backing up, and when startled out of a sound sleep, it begins to bark like a car alarm. The spot was created by DDB & Tribal Amsterdam, and directed by Mattias Schut at Czar. OK I admit it, I am a snooze button abuser. When 6:30am arrives with the unwelcome sound of my alarm I know exactly how many snooze button slaps I can get away with before I am in danger of missing the train to work. Whether you are a Snoozer, Grump, Grunter or a Zombie first thing in the morning? Philips thinks it can help and wants to help make you a better morning person. They are looking for people to join their Wake-Up Challenge and swap their alarm clocks for the Philips Wake-Up Light for three weeks. Selected testers will receive a Wake-Up Light for free. For the first week they will record their ‘first thing in the morning’ mood using their old alarm clock for a week, then for the next two weeks weeks they will record their morning mood using the Wake-Up iPhone app. The Wake-Up Challenge is only running in Europe right now, so it looks like the rest of us are still going to be waking up grumpy and groggy for a little longer. The site features wonderful animation and graphics that look like they are constructed our of paper, although I’m still scratching my head a bit about the scene with the woman waking up in bed with a cow. The creative comes from DDB Amsterdam, Tribal DDB Amsterdam and the production was done by MediaMonks, Keytoon Animation Studio and Elements Interactive. 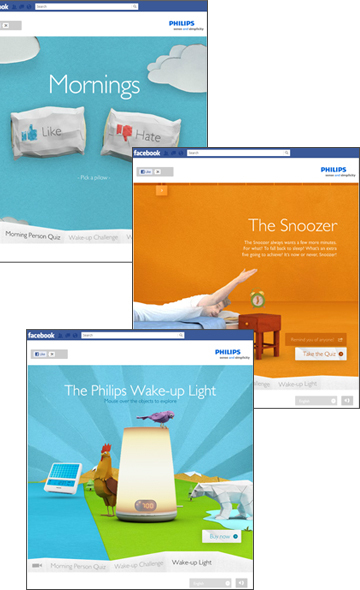 The Philips Facebook page also features video clips of Philips past campaigns including 2009’s ‘Wake-up Light vs The Sun’ in which the Philips team placed a Wake-Up Light in a chicken coop to fooling Simon the Rooster into thinking that it’s already morning, and 2010’s ‘Wake Up the Town’ challenged the residents of Svalbard, Norway (the norther-most town in the world) to try out the Wake-Up Light during their 11 weeks of darkness.